No wonder many people said that training is only for big companies as small companies (typically those with less than 20 staff) and micro companies (those with less than 10 staff) will simply see training as impossible. This is despite the Singapore government’s Workforce Development Agency (WDA) is giving up to 90% course fee subsidy for courses under the Work Skills Qualification (WSQ) framework. On top of that, companies enjoy 60% cash back for the remaining 10% of course fees under Productivity and Innovation Credit (PIC). 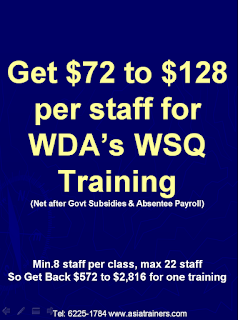 Also, WDA will reimburse Absentee Payroll for up to 80% of the staff hourly salary (for hours while the staff is undergoing training), capped at $7.50 an hour. In fact, after WDA’s 90% funding, PIC 60% funding for the remaining fee, plus Absentee Payroll, the net outlay for training is actually negative. 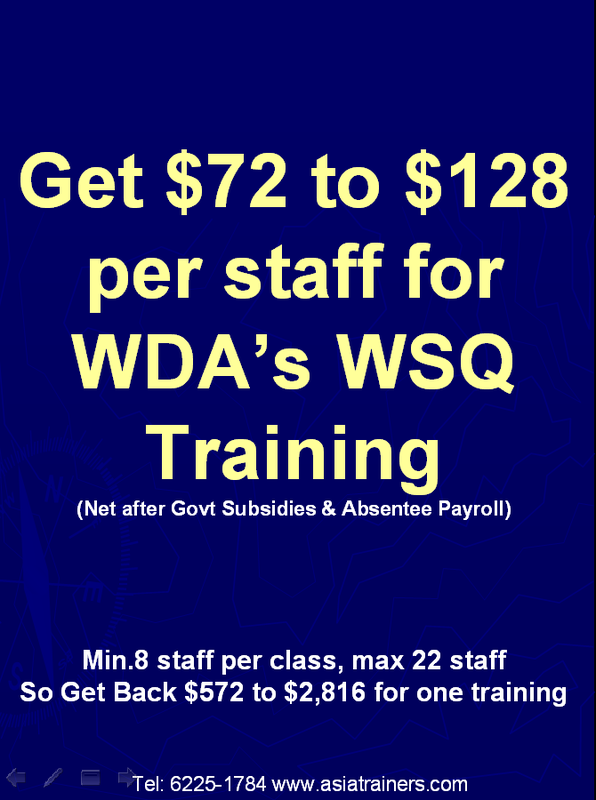 That is, the company makes money (get back more cash) from sending its staff for training under the WSQ framework. Since training is actually cash flow positive for the SMEs, why aren’t they sending people for training? As a trainer with over 28 years of working experience, plus over 15 years of working with numerous SMEs in 120 industries in Singapore and Malaysia, I believe that we need to tackle the top five concerns of SMEs in regards to training. By spreading the staff into several batches, we can rotate the staff for training, thereby ensuring that at any one time, there is always someone at work. For example, if a company has 15 staff to train, it can break them up into 2 batches, with each batch made up of staff from different departments. With the staff also overseeing another department’s work, there is always someone at work even when staff are attending training. We can get the Trainers to conduct the training in languages that the staff can understand, including the use of Malay, dialects and body language. For staff with lower education, instead of using long lectures, we use short video clips to explain the concepts, followed by experiential games and role plays. In fact a company that we trained recently has a staff over 90 years old with less than primary education. She told us that she can understand 90% of what are taught as the trainers use the above mentioned methods to teach. Here we get the managers and bosses to be in the same class as the staff, and they will guide their staff on the application during the training. Our company only does in-house training, that is, your staff will not be away for work, for they will attend the training at their workplace. There is zero travelling time and cost incurred. Since we are conducting the training in-house on-site, our training schedule can be more flexible. For example, a 3-day course “Cultivate Workplace Relations” could be conducted over 6 half-days. In this way, your company can get the staff trained without having to release them away from their work. If there are any last minute operational issues that need to be addressed, the staff can attend to them by just taking a short break away from training. In this way, training does not affect work at all. Concern 5: “Even if the above concerns are addressed, the training will not be relevant and immediately useful for us because they are not customized and based on our company’s situation. Our company does only customized in-house training, therefore all our training are 100% customized to your company’s situation. For example, in our “Respond to Service Challenge” training, we use real life cases as teaching material. Our trainers will get the trainees to talk to a real customer and learn how to resolve a customer service challenge on the spot. By Andy Ng, a Trainer with over 28 years of experience. Andy now specialises in promoting WDA’s WSQ courses covering the subjects of “Leadership and People Management”, “Service Excellence” and “Business Success Excellence”. Email to Andy at hpa88@singnet.com.sg or text him at 8201-4347 now.